What are the 2019 Mazda3 hatchback specs? Which 2018 Mazda model has the most storage space? 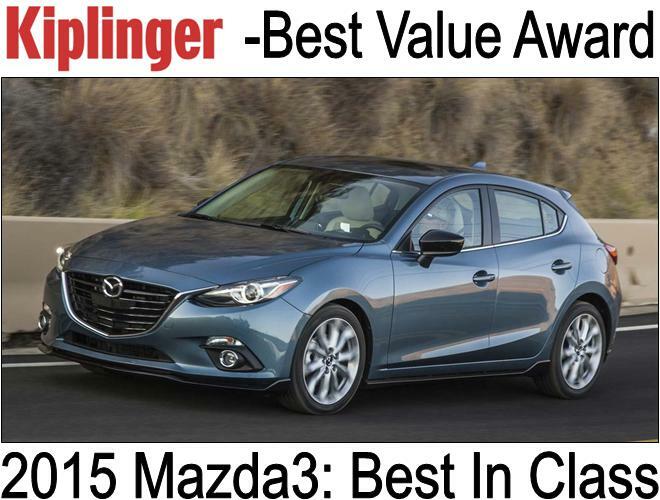 The 2015 Mazda3 has earned The Kiplinger Personal Finance Best Value Award! Most Auto Shoppers are all looking for the same thing, to get the most value for their money. The experts at Kiplinger Personal Finance have done the reseach, compared the compitition and chosen their Best. The Mazda3 might be a compact gut it packs a punch in value! The winner of last years Best New Car Award it has above average resale values, impressive fuel economy, top safety ratings, and loads of cargo space, whether you choose the sedan or hatchback. Advance Tech options include a regenerative-braking system to save more fuel, plus safety features such as adaptive headlamps, blindspot monitors, radar cruise control, smart city bracking and more. Mazda Drivers and Passengers are Safer than Ever Before! Thanks to emerging safety technologies in Mazda vehicles, our drivers and passengers are safer than ever before. Mazda’s goal is to make use of technology to produce vehicles that both help prevent and reduce damages in the event of a collision. Mazda’s innovative Advanced Safety Technology, Branded i-Activsense makes use of the latest sensing devices such as milliwave radar and cameras to achieve the goal of assisting the driver and vehicle in recognizing hazards, preventing collisions and minimizing damages should an accident occur. On every vehicle, there are obvious or not so obvious blind spots. On your Mazda, the Blind Spot Monitoring checks those areas; and if it detects an object, it will give the driver a visual alert in the mirrors on the outside of the vehicle. If you activate your turn signal in the same blind spot direction the object is detected, the vehicle will beep to alert the driver. Swivels headlamps up to 15 degrees in the direction you’re steering, revealing more of the corner. With Mazda’s Radar Cruise Control, the system will determine the difference in distance and speed for the vehicle in front of you. As a result, MRCC will automatically adjust your the speed of your vehicle to ensure a safe speed. With Forward Obstruction Warning (FOW), the system will effectively monitor the speed of the vehicle in front of you. When there is a high risk of collision, your vehicle will issue audible and visual alerts for you to take evasive action. This system is functional between the speeds of 9 and 92 mph. By using radars on the side of the vehicle, the Rear Cross Traffic Alert (CTA) keeps you informed of objects approaching from the side. In the event an object is detected, you will have both audible and visual warnings of the object in the monitored area. The Lane Departure Warning System effectively monitors the lines on the road. If your vehicle predicts you depart from those lanes unintentionally, the vehicle will issue you a warning. High Beam Control is an intuitive system that switches your head lamps between high and low beams based on your driving condition. Helps prevent or lessen, low-speed impacts. At speeds of 3-18 MPH, SCBS monitors the vehicle in front to assess the possibility of a collisions. If the system detects a high risk of impact, it applies initial braking pressure to deliver faster response should you brake. If you brake, the system de-activates. If you don’t brake, the brakes are applied automatically. We invite you to Schedule a Test Drive or stop by our showrooms to experience Mazda’s outstanding advancments in vehicle and passenger saftey for yoursellf. 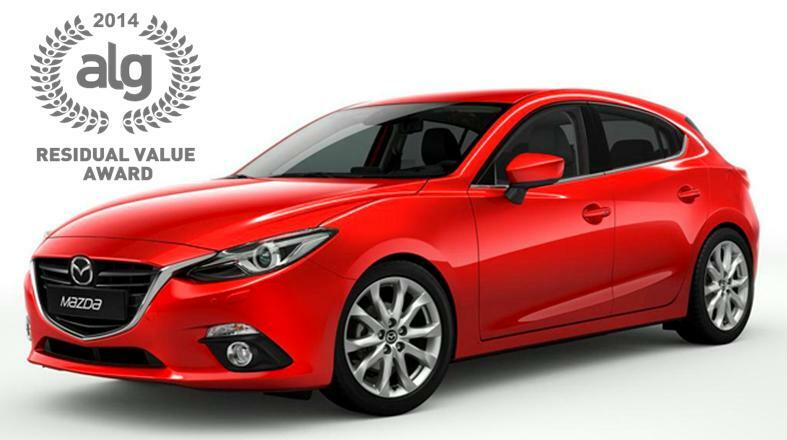 Mazda Puts Safety First -The Mazda3, Mazda6, and Mazda CX-5 Are All Rated IIHS Top Safety Pick Plus! The 2015 Mazda3, Mazda6 and Mazda CX5 all earn the Top Safety Pick “Plus+” Rating by the Insurance Institute For Highway Safety and offer the highest levels of occupant crash protection in their class. Through years of study The Insurance Institute For Highway Safety has found that rarely are vehicles involved in direct head on collisions. Most often drivers manage to swerve and hit another car or tree on the left front 25% of the vehicle. Unfortunately most vehicles are ill-equipped to absorb this type of impact. The wheel assembly gets pushed in towards the driver and in turn intrudes into the leg area of the cabin and most often deflects the steering column over. The problem here is that the airbag that deploys from the steering wheel is now moved to the right of the driver, allowing the drivers head to hit the dash, windshield or A-pillar of the car. Mazda has addressed this by sweeping the crumple zones all the way out toward the fender, rather than coming back directly to the struts. This allows the car to absorb the energy of the 25% overly impact, decreasing the likelihood of injuries. The Small Overlap Frontal Crash test involves running the car at 40 MPH into a barrier on the left 25% of the vehicle. If the wheel assembly is not forced into the drivers space and the crash test dummy hits the airbag, then the car passes the test. So when you see that a car is “Top Safety Pick Plus”, this is the “Plus” part of the test. The Mazda3, Mazda6, and Mazda CX-5 all pass the test and offered the highest levels of occupant crash protection in their class. Mazda Has The Best Fuel Economy In The Nation! Mazda Once Again Tops The EPA Fuel Economy Report for the 2nd Consecutive Year! The EPA Fuel Economy Study reports Mazda to be the Most Fuel Efficient auto manufacturer for the second straight year. Mazda was top of the industry with fleet wide fuel economy performance of 28.1 mile per gallon. Mazda also had the best fleet wide CO2 emissions of just 316. The EPA state that based on next years preliminary numbers, Mazda should have the top spot again next year. Most impressive is that Mazda has achieved this top ranking without offering a single electric or hybrid vehicle. Instead it has concentrated on improving the efficiency of the conventional gasoline engine through the use of the company’s unique and proprietary SKYACTIV® TECHNOLOGY. SKYACTIV® TECHNOLOGY is a suite of component and engineering technologies that incorporate ultra-high compression ratio gasoline engines, super-efficient manual and automatic transmissions, lightweight chassis and body components, reduced rolling resistance and low-drag body styling. Furthermore, Mazda has achieved this fuel economy rating while producing outstanding, top performing, affordable mainstream vehicles that require only regular octane gasoline. Mazda’s SKYACTIV® TECHNOLOGY is now offered in the Mazda3, Mazda3 Hatchback, Mazda6 sedan and Mazda CX-5 SUV. The Mazda3 reaches near best-in-class EPA estimated fuel economy with 41 highway MPG when equipped with the i-ELOOP energy regeneration system. The Mazda6 equipped with i-ELOOP achieves class-leading EPA estimated fuel economy with 40 highway MPG. At an EPA estimated 35 MPG, the Mazda CX-5 retains the title of the highest highway MPG of any SUV in North America, including hybrids. assuring an outstanding ownership experience and lowering your cost of ownership even further! So Explore our Inventory, Schedule a Test Drive, Get A Price Quote or Apply for Credit right online on our new easy to use responsive web site!